The betting favorites showed some improvement in Week 8 of the NFL season. However, it wasn’t enough to inflate bettors’ bankrolls. The favorites were a solid 11-3 straight up in Week 8 and just got over .500 against the spread at 8-6. If that improvement continues, then favorites bettors might finally see a winning week in these NFL Week 9 betting matchups. Week 9 begins Thursday night with the Oakland Raiders at the San Francisco 49ers as a 3-point road underdog. Oakland has lost three straight SU and ATS, and on the road, they’re a terrible 1-9 SU and 2-7-1 ATS in their last 10. The 49ers have dropped six in a row at 2-4 ATS. They’re also 1-12 ATS in their last 13 as a favorite. Then, three divisional matchups highlight the Sunday slate. These include the Detroit Lions at the Minnesota Vikings, the New York Jets at the Miami Dolphins, and the Pittsburgh Steelers at the Baltimore Ravens. The Vikings are a 5-point favorite versus Detroit, but they’ve disappointed when favored lately, at 2-5-1 ATS in their last eight. Minnesota is also 1-4-1 ATS in their last six at home. Detroit had a five-game ATS winning streak snapped last week after they were upset by the Seattle Seahawks. In their last four games in Minnesota, the Lions are 3-1 SU and ATS, all as an underdog. The Dolphins are a slim 3-point favorite versus the Jets. But in their last 10 at home versus New York, they’re 4-6 SU and 3-6-1 ATS. The Jets are 14-4-1 ATS in their last 19 trips to Miami. However, in their last nine road games overall, they’re only 1-8 SU and 2-6-1 ATS. The Ravens are a 3-point favorite versus Pittsburgh. In Week 4 the Ravens upset the Steelers 26-14 as a 3-point underdog, improving to 6-1-1 ATS in their last eight against them. The Steelers head into Sunday having won three straight SU and ATS. On the road, they’re 8-0-1 SU and 6-3 ATS in their last nine. 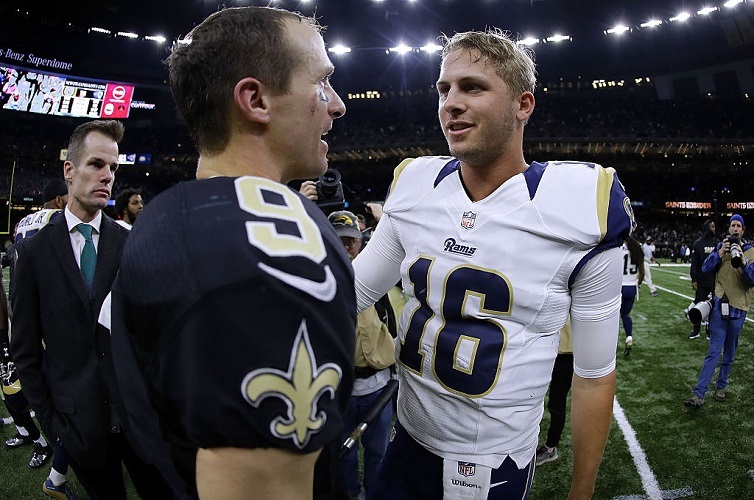 In what looks like a possible playoff preview, the New Orleans Saints host the Los Angeles Rams this week as a 1-point favorite. The undefeated Rams are 4-3-1 ATS, and in their last 14 as an underdog, they’re 2-12 SU and 2-11-1 ATS. The Saints have won six straight SU and five in a row ATS. At home, New Orleans is 10-1 SU in their last 11, but only 5-6 ATS. Both teams are favored in their divisions, according to the updated NFC division odds. On Sunday night, Tom Brady duels Aaron Rodgers when the New England Patriots host the Green Bay Packers as a 6-point favorite. Green Bay is only 2-3-1 SU and 3-3 ATS in their last six, and on the road, they’ve lost five straight at 1-4 ATS. New England has won 11 straight at home at 9-2 ATS. But they’re 1-4 ATS in their last five at home versus Green Bay. Week 9 concludes Monday night with the Tennessee Titans at the Dallas Cowboys as a 6.5-point underdog. Tennessee is 4-8 ATS in their last 12 road games, but 4-1 ATS in their last five games in Dallas. The Cowboys are coming off their bye, and are a solid 10-3 ATS in their last 13 following their bye week.